Take to the lanes to destroy the marauding zombie menace. 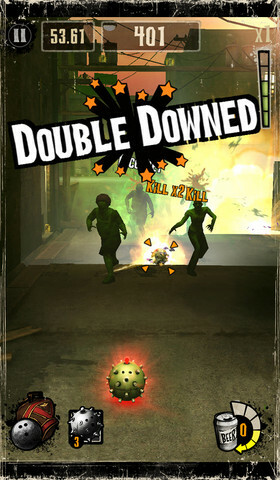 If you think you've played every single mobile game the zombie genre has to offer (and we've played more than most), you can't say you've experienced everything until you've had a go at Activision's new mobile game, The Bowling Dead. 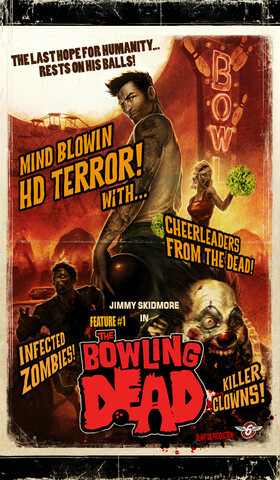 It's a game that makes an unlikely combination of post-apocalyptic zombie survival with the precision sport of bowling. Your hero, lone survivor of the US wastelands, is an expert bowler and discovers a secret weapon stashed away by the US government in one of his local alley lockers. This blistering bowling ball has the power to knock out enemies better than any gun on earth, and so he embarks on a mission to clear the city of the zombie menace. Most of the time you'll be facing off against the invading hordes in a series of building back-alleys, with the approaching zombies shambling slowly towards you. You'll need to take each of them out with a precise flick of your bowling ball, with bonus points awarded if you manage to take out a series of enemies with just one shot. You're not just limited to precision bowling assaults though. Should a shambling zombie get up-close-and-personal, you'll enter a melee combat mode that amounts to a fight to the death. Using your blade you'll have to swipe your assailant in the direction of the arrows that appear one after another. Run out of health and it's game over, but see the opponent off and you live to fight another day. Later levels get a little trickier, and you might need to carefully curl your shot to avoid an exposed manhole which will otherwise swallow up your shots. You'll also have to handle zombie packs that approach from different directions. A warning icon will indicate that you need to switch perspective, and a screen-swipe in that direction will change your directional aim. These later levels are a careful balancing act between survival and destruction, and once you've mastered them you can head into the endless Survival section of the game. To spice up the combat a little bit, you can hit up the in-game store to spend the currency you've earned. Here you can invest in keener blades which allow you to whip away at melee opponents more effectively. Perhaps you'd like to invest in explosive bowling balls that can take out entire packs, or a mirror ball that will temporarily cause the zombies to dance on the spot, while you bowl them into oblivion at your leisure. Fancy going to town with a chainsaw instead? There's an option for that too. So, the developers haven't shied away from adding plenty of silliness to what is already a pretty silly scenario. If you want to explore every last upgrade in this free game, you'll probably need to invest some of your real money at some point, but there's more than enough content up front to keep you busy and amused for at least a few hours this weekend. What's Hot: A slick and original zombie game, that combines flick gameplay with a suitably silly story and upgrade system. What's Not: Curved shots can be a little unreliable, and you'll likely have to spend a chunk of real money to enjoy everything the game has to offer.